The delayed arrival of winter temperatures has led to a 9% drop on Irish wholesale energy prices (Gas) from last month. The Naturgy Energy Review and Forecast for January 2019 shows Irish wholesale energy prices (gas) remain significantly higher compared to January 2018, increasing 15% year-on-year. The review also shows that electricity prices have increased by 5% month-on-month, but are a substantial 55% higher compared to January 2018. On average, renewables account for 30% of the power generation mix, with wind generation down a significant 23% from the previous month. “The increase in electricity prices can be attributed to the unplanned outages at baseload generators like Moneypoint and Great Island which are vital to security of supply as Moneypoint alone can meet 16% of Ireland’s electricity requirements. We also witnessed record price spike in the imbalance market during the month”, added Ms. Stewart. Sentiment in the wholesale gas market continued on its bearish trajectory in the month of January, having shed value of 9% from the previous month. The outlook for January looked bearish from the offset after receiving record LNG supply into Britain from the previous month. January experienced 5 LNG deliveries into British terminals, increased flows from the Dutch and Belgium interconnectors and domestic storage filled to 85% capacity. These bearish market fundamentals caused gas prices to shed value by 9% within a seven day trading period towards the end of the month. While market fundamentals, like temperature and security of supply, weigh on near curve contracts, the wider energy complex has a greater impact on contracts further out the curve. Bearish indicators from oil and carbon markets fed into curve as gas contracts for the coming two winters shed value by roughly 1p/therm during January. Wholesale electricity prices have risen by 5% to an average of 7.91 c/kWh for January. Baseload generators like Moneypoint and Great Island have also been offline due to unplanned outages. These generators are important for security of supply as a new record price of €3,774/MWh was registered in the imbalance market on the 24th January. Moneypoint alone can meet 16% of Ireland’s electricity requirements. 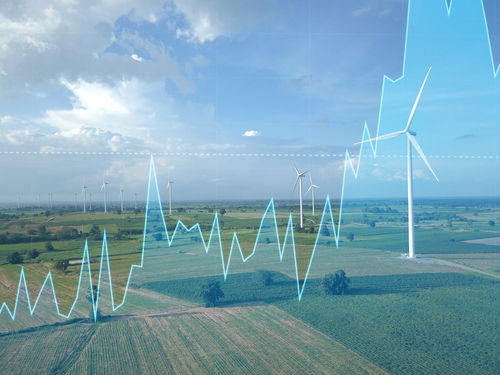 Wholesale electricity prices varied significantly week on week with the prevalence of wind influencing its direction. On average, renewables accounted for 30% of the power generation mix, with wind generation down a significant 23% from the previous month.